Happy Birthday, John Cage: Do You Know This Cake? John Cage celebrating his birthday with an unidentified friend in Minneapolis, September 1982. Courtesy Walker Art Center. Today we, like many others, are remembering John Cage on what would have been his 100th trip around the sun. In 1982, in honor of Cage’s 70th birthday, the Walker produced the exhibition Happy Birthday John Cage. In addition to showing works by his friends and collaborators such as Louise Nevelson, Jasper Johns, and Robert Rauschenberg, the exhibition also featured pieces from Not Wanting to Say Anything about Marcel, 1969, a series of screenprinted plexiglass plates (“plexigrams“) that Cage produced with Calvin Sumsion. 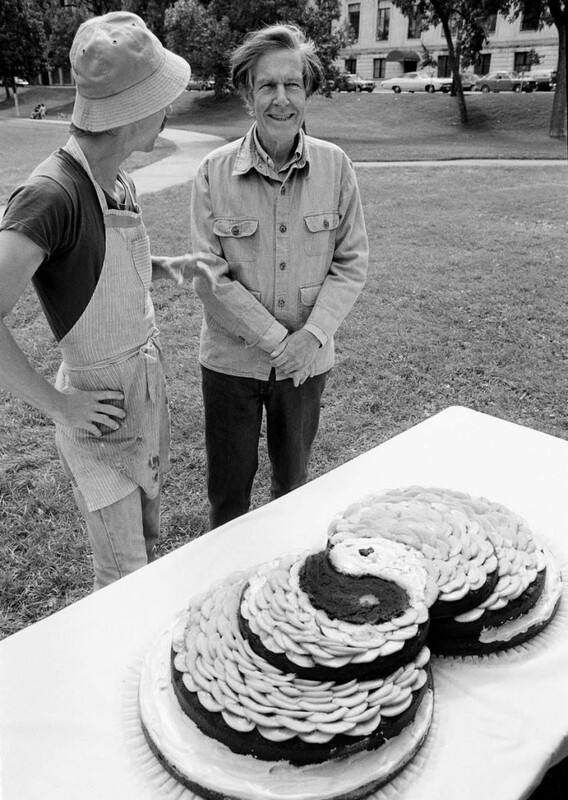 The 70th birthday celebration also included music and dance performances, poetry readings, a symposium called John Cage: Art and Influence, and the masterful yin/yang cake pictured above. If you have further details on the story behind this cake, who produced it, or what it consisted of, please help our archive fill in the details.